This article originally appeared in the 15th Annual Tri-State Pottery Festival 1982 Plate Turner's Handbook. In the late 1800's, when Travelers Hotel was built, there were eight hotels in East Liverpool. Thomas Lounds is the first known proprietor. The original name was the Landora. 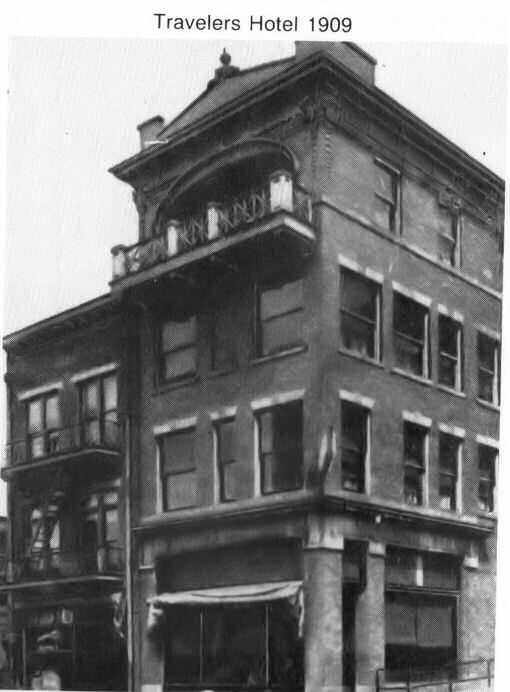 The hotel stands today on the original location at 117 East Fourth Street. Thomas Lounds evidently only kept the hotel a short time before selling it to William Hill and Richard Edmunston. Later the Edmunstons became the sole owners. Mrs. Edmunston brought Michael Forzano to manage the hotel. Mike later brought his two brothers, Frank and Richard, to fill many of the positions needed to keep a smooth running complex hotel. In the summer of 1981 Richard Forzano, the only surviving brother, sold the hotel to Norman Six and his family, and a revival of the Travelers is underway. The first hotel was the width and length of what is now the lobby. At this time the hotel entrance was at the corner of Crook Alley. In 1910 the Banquet Room and the kitchen area were added. In 1927 the Dining Room and Jigger Room became the East Fourth Street addition to the hotel. The "Sample Room" is now a small banquet room, but its first public exposure was as a showcase for traveling salesmen who came to the city. The custom then was to invite the local buyers to the hotel for showings rather than the salesman visiting each retail establishment. If a great deal of display area was needed, the third floor was available. The elevator and attendant were ready and willing to carry passengers. Service clubs met in the basement rooms. The steps to the basement from Crook Alley gave the clubs their own entrance. The Round Table in the dining room served as a luncheon meeting spot for pottery management from both sides of the river. The closing of the Old Chester Bridge brought an end to this custom. One of the many delightful tales about Travelers concerns a former Governor of Ohio who came, with his entourage, for lunch at the hotel. One of his aides advanced to the round table to claim it for the party. The waitress was immediately at his side to tell him, regretfully and worriedly, that the table was always reserved for the Pottery men. The disbelieving aide asked if she was aware he was in need of the table for the GOVERNOR OF OHIO. Loyalty won out at the hotel. The waitress stayed with her potters, and the Governor and his party sat here, and there, and there!! Until 1961 the First Presbyterian Church was located where the drive-in bank of First National now stands. Regular and chronic complaints about the church came from the hotel guests who were unable to sleep on Sunday mornings because the Presbyterian bell was rung, by hand, regularly and enthusiastically, by the young church members. Travelers is one of the few remaining river town hotels built facing the river. East Liverpool was fortunate in having Route #30 coming down Market Street and circling at the front of the hotel. River town hotels generally were placed high enough on a river bank, facing the river, in order to catch the eye of the river travelers. Mike Forzano was a golfer. During his time at the hotel he had Cedric Wilson fix a small driving range, complete with a screen "catcher", in the basement, so that he could practice, or get rid of his frustrations! In 1957 one hotel guest was so impressed with the history, scenic beauty, and unique pottery industry here that he decided to add to it, making a clay sculpture that is 180 pounds in weight and six feet by three feet in size. It hangs on the Jigger Room wall. A potter's jigger, various ceramics, the Ohio River, a barge, and a jiggerman all are depicted. If you look closely at the jiggermans right foot you'll see the signature of the sculptor . . . Al Dye, May 30, 1957. There are many views from the various floors and the various sides of the hotel. One of the most unusual, as seen from the second floor, is that of a small tombstone supporting a flight of steps in a small courtyard at the hotel rear. The steps and the building connected to it are the property of the Frank Crook Company. The writing on the Tombstone clearly says "Edwin Bloor, Died July 5, 1860." Lower on the stone, weathered by time, is engraved "Aged 8 years, 2 months and 24 days." It has been impossible to trace the records of this unusual tombstone location, or of the small boy so immortalized. The most accepted theory is that the tombstone was moved from a private cemetery no longer in existence, and the tombstone put to a practical use. The Ceramic Theater, across East Fourth Street from the hotel, was used originally as a live theater. Many of the performers there stayed at the hotel. Blackstone the magician was there, Paul Whiteman, Marion Anderson, the Marine Band, and; in 1982, the Roger Wagner Chorle. The renaissance underway the hotel is a nostalgic one. The revival of the hotel is also the revival of bits, small and large, of many of the old buildings around town. For instance; the lobby lights are from the Moore Building when the Moore furniture was there; the brass door guards and handles on the double doors to the dining room are from the King and Eells Hardware on West Sixth Street; the marble at the office area and the "cage" with it are from the First National Bank when it was on Washington Street; the lobby clock is the old one used in the hotel. Owner Norm Six is still learning about the keys beneath the clock dial. It was a call signal to indicate whether rooms were occupied, cleaned, or in need of attention. The decor today is early American, with a Williamsburg Blue threading throughout the wallpaper, drapes, and painting being done. Pictures of bygone scenes and days will, in the near future, add to the interest of the welcoming lobby. The 105 rooms of the hotel are all to be restored for use. Several have been restored and are already in use. The solid wood of the doors has been kept, with the grain of the wood showing through the gloss of the varnish. The tops of the doors have unusual transoms. Small shutters are installed vertically so that air can be circulated, or cut off if a chill wind blows. Tentative future plans include rental apartments on the Third Floor. At the top of the stairs on the second floor is the Bosses Suite, where Mr. & Mrs. Six have an office. The second floor also holds what might have been a "Honeymoon Parlor" in the days before traveling become a honeymoon tradition. Restoring and running the hotel is a family effort. To clean out the debris from the upper floors with some sort of speed, the fire escape on the Crook Alley side came into use as a 'way station" for boxes and boxes of throw -out-tables. A good pitching arm to the small truck parked in the alley below provided a most ingenious shortcut to clean-up. Employment at the hotel is more than a job - it is a career and a way of life for the people there. Employees have been with the hotel 25, 30, or even 40 years! Loyalty and interest are abundant, and the enthusiasm created by the renaissance is infectious, both to the staff and to the customers. Norman Six is a former school teacher and a former coach in the East Liverpool school system. So while David Blythe has been called the "Historian With A Paint Brush" and Will Thompson is being called the "Stephen Foster of Ohio", Norm, too, is a "Historian With A Paintbrush and a Screwdriver . . . and a Hammer. . . and a Walkie-talkie. From this point on all pictures were taken November 19, 2011, unless otherwise specified. The restoration mentioned above did not happen. About 1997 Ray Trevelline bought the Traveler's Hotel and another effort to restore the hotel began. It didn't work either and Ray sold the Hotel in 2012. It is now a College of Cosmetology. As you enter the building through the front doors, to the left is the hotel dinning room and inside doorway to the cafe. The counter where payment is made for meals at the left front of the Dining Room.